The SeceuroShield 150 (previously known as the SeceuroScreen 1500) is the perfect internal shutter. Despite being unpractical for shopfront protection, use as garage doors or to protect commercial windows, it more than meets the needs of what is required for low security domestic sites, bars, serveries and service windows. Supplied as both built-in or built-on, they provide a firm foundation for preventing crime and vandalism within areas with high volumes of people. A manual override option is also available as an optional extra with an additional surcharge. It is worth noting that the shutters are lightweight and are therefore ideal for manual operation, however we do still offer alternative operating systems. A counterbalance spring in the axle ensures controlled raising and lowering. An espagnolette keylock locks into the guide rails and is usually incorporated in the bottom slat. Final adjustment of the springloading after installation is always required. Electric operation is required on larger shutters due to weight but is optional on smaller shutters. 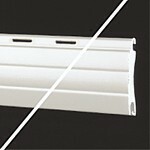 The slats are also available as vented and non-vented. 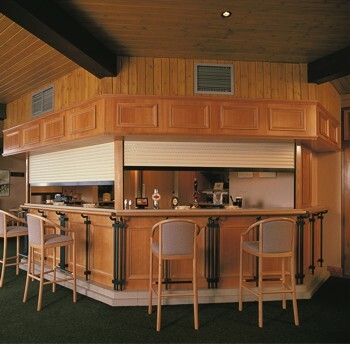 Vented slats allow a fresh flow of air through the shutters and allow light to project through the shutter. The non-vented slats offer very little light. The bottom slat is constructed from extruded aluminium with a rubber bottom seal. A reinforcing handle option is available as an optional extra however this comes with an additional surcharge. Despite the lightweight frame and the compactness of the SeceuroShield 150, it offers good strength, insulation and sound deadening. Fitted with the H25 guide rail as standard, the SeceuroShield 150 is also available with the H17, H30 or the high security H40/S guide rail at an extra cost. The H25 rail is constructed using extruded aluminium with an integral box section for reinforcement and to facilitate fixing. High density 6mm pile brush seals are integrated for a quiet and smooth operation. The H25 guide rail is 53mm wide x 22mm deep. For greater levels of security, the H30 H40/S guide rail offers a higher specification than the standard guide rail H25 and incorporates windlocks and anti-vandal anchors. The built-in shutter is normally installed to the client’s window frames within our factory premises. This enables the window and the shutter to be installed as an integral unit and ensures that each shutter is fitted accurately and in a controlled environment. Care must be taken with the built-in system to ensure that there are no obstructions such as vents or handles that would interfere with the shutter installation and operation. To avoid such problems sliding or inward opening windows are preferred. Should it be necessary to install outward opening windows a clearance of 75mm is required from the top of the opening light to the underside of the shutterbox. Standard shutters lock automatically at the top when fully lowered. The bottom section of the shutter box is riveted after installation. The fixing screwheads are rendered unusable and are concealed behind cover caps. Optional 30 x 20 angle can be fixed on to the sill. Construction: SeceuroShield 150 is a double skin foam filled aluminium slat. It is vented as standard but also available non-vented. Common Use: Internal use on low security domestic sites, bars and serveries. Not for shops, garage doors or commercial windows. Stock Colours: White, brown, cream or woodgrain effect. Bottom slat - White, dark brown. Construction: Roll formed aluminium in two sections, top and bottom boxes. The bottom box is removable for installation and maintenance and is chamfered at 45°. Honeycomb section PVC. Removable vertical panel for installation and maintenance; tight clip fitting to withstand draughts and moisture ingress. Drive mechanism mounted on metal inner plates for stability and easy access for maintenance. Box Ends: The shutterbox is assembled on die cast aluminium plates. Finishing: External shutters require a silicone seal between the shutter and the wall along the top of the box and down the side of the guide rails. Operation: By tubular motor inside the axle. Motors: Draw 240 volts and 0.5 - 2.5 amps dependant upon the shutter size. Complete with integral limit switches, thermal cut-out to prevent overheating and with 2.5 metres of cable for connection. Control: By momentary switch which must be held until the shutter reaches the desired position.